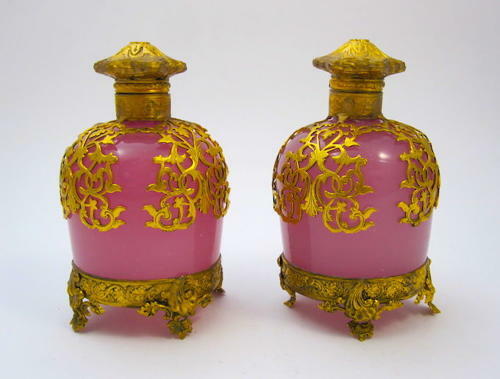 Pair of Rare Antique Palais Royal Pink Opaline Perfume Bottles with Dore Bronze Mounts. Each Hortensia Pink Opaline Glass Perfume Bottle has Fine Dore Bronze Mounts on the Body, 4 Scroll Feet and Dore Bronze Lids. Perfume Bottle Include Inside Stoppers.